Literary Locations is a new feature where I will spotlight some of the wonderful, literary places I visit. 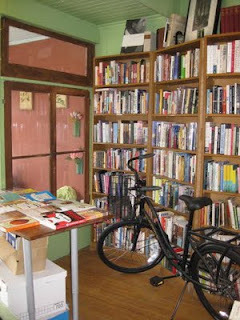 Some small town bookstores are a little bit like closets. You step into a glorified crawl space that's filled with dust without much selection. The bright colors and cute monkey on Monkey See Monkey Read's sign give a promising appearance, and the store is just as great once you get inside. It's cozy, without being cramped or over-crowded. Located at 425 Division Street in downtown Northfield, Minnesota, this is probably the bookstore that I shop at the most because it's pretty close to me. One thing I love about Monkey See Monkey Read is that it offers a little something for everything not only in terms of products but also in terms of price range. I've found products like used copies of Lemony Snicket books (in great condition, might add) to wonderful adult fiction to non-fiction. Monkey See Monkey Read also allows readers to place special orders, so if they don't stock a book I'm looking for, it's still easy to get my hands on a copy. Since I know the owner of the store, namely Jerry, personally, I decided to have him tell you more about the store himself. Be sure to check out what he has to say, and visit the store yourself if you're ever in Northfield. Tell us about your bookstore and how it came to be. I’ve been a bookseller for almost 20 years. For a long period of time, I’ve wanted to open my own store, something small with a good selection and a friendly atmosphere. So I took the plunge in 2006. Your bookstore has an incredibly unique name. Can you tell us more about the story behind it? My daughter came up with the name. She was 10 years old at the time. My spouse studies monkeys, so the name combines her work with mine. What demographic does Monkey See Monkey Read cater towards? Everyone I think. We’re a general interest store. We sell books for all ages. What made you decide to sell used books as well as new books? I started out with used books. It’s easier to get started in that way. The investment is not as great. Then I added some new books to the inventory. At first it was just regional books and some bestsellers. Gradually, we’ve increased our selection of new books. It feels like a good mix of new and used. I prefer to have used books, because we can offer the customer a better value. But we need to fill in the gaps with new books so our selection is stronger. Your store is very unique in that in addition to selling books, you also have a few bikes for sale. Can you explain what inspired this unique combination? For every two bikes I sell, Kona will donate one to a home health worker in Africa as part of the BikeTown Africa program. 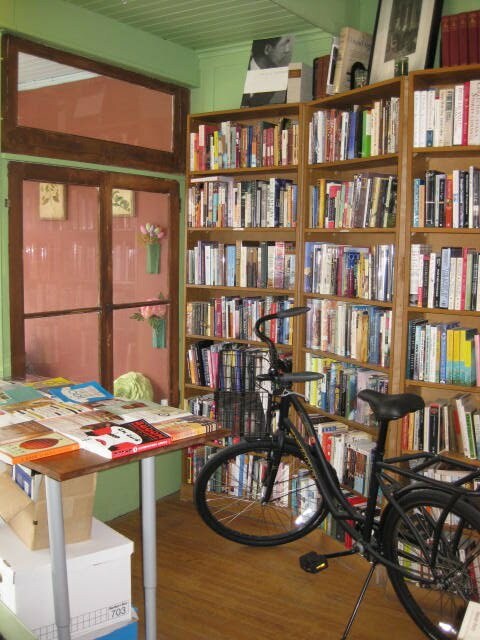 What are the challenges of owning and running an independent bookstore in a small town? Inventory selection. I’d love to have a much larger selection. But it’s not realistic given our sales. We have to edit our selection to what we think we can sell. It’s tough to pass up good books, but sitting on dead inventory can sink a business quickly. So we try to choose wisely and sometimes we’re wrong. I’ll bring in books I think will sell and they don’t or skip over books I deem risky and people ask for them. You never know what’s going to be a hit. Book sales are constantly being changed by new technologies such as e-books. How and if do you see Monkey See Monkey Read adapting to this new climate? I think you have to listen to your customers and figure out what their interests are. Things change and we have to change with them. I think ebooks are great for some people and a novelty for others. Right now they are hot and creating a lot of buzz. I still have not decided when or if we will sell ebooks. I think at some point we will, but it’s a risky proposition. That looks like such a cozy bookstore. I think this is a great new feature Liz. Keep them coming! What a great feature! If I am ever in Minnesota I would definitely visit this store - it seems so cozy and the owner sounds really nice and sincerely passionate about books.